BEIJING—Chinese Olympic officials say they are no closer to catching the swashbuckling, green-uniformed archery competitor who has disrupted every single medal ceremony of the Games by bursting in, stealing the gold medal or medals in the name of the poor in an archery-related fashion, striking a triumphant pose, and then disappearing without a trace. "Good people of the world, take heart!" the mysterious figure said in his most recent appearance, when he burst into the medal ceremony for the Men's 200 Meter Freestyle. "Truly, these are good men, doughty and true; and their swimming has won the day. First place in the very world may they rightly claim, but in the name of the poor, the sickly, the lonely old, and the weak without voice, I hereby claim this gold that with it I may do greater good!" The archer then shot a goose-feathered arrow through the ribbons holding the gold medals around the necks of the U.S. team, causing their medals to fall to the ground. The archer himself proceeded to leap from the rafters, alight on the podium's top step, collect his prize, and disappear through a nearby window. 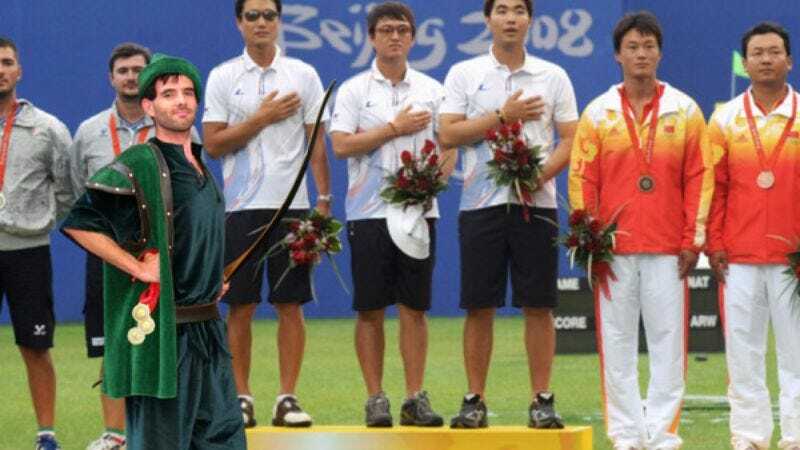 Since entering China last month by using a forged Sherwood Forest passport under the name Robert Huntingdon, the archer has appeared at more than 70 medal ceremonies, escaping with the gold every time. In almost every case, archery-related schemes were used to secure the medals, although some were more difficult for him to obtain than others. An epic four-way fencing match broke out during the Women's Saber medal ceremony, with the archer taking on the three American women in a clash of blades that spilled out onto the balcony and across the Beijing rooftops. Germany's Ole Bischoff, winner in the Men's 81kg judo event, threw the archer through a nearby table and down a flight of stairs before his feet were nailed to the ground by arrows. And the Chinese women's gymnastics team was almost impossible for the archer to catch. The athletes themselves are divided in their opinion of the bow-weilding outlaw. Although many regard him as annoyance at best, and still others as a dangerous menace, a considerable faction has voiced sympathy for his cause. "Put it this way—that guy has some stuff of mine, but he's welcome to it," said U.S. swimmer Michael Phelps. "I mean, I'm not political, really, but I've had a lucky life. If my gold medals can help someone get a hot meal and a place to sleep for a few nights, that's okay. It doesn't mean I didn't win." Phelps confessed his admiration that, although the archer had burst into the ceremony for the men's 400 Meter Relay, the team had been allowed to keep a single medal, as the archer praised the "epic performance by four doughty good men and true, who soundly defeated the Norman French, uplifted the hearts of all who saw, and enriched the very World thereby." Chinese officials have been less charitable. "His disregard for our culture, our laws, and these Games will not go unpunished," a statement from the Chinese Olympic Committee read in part. "We demand he turn himself in, return the medals to the rightful winners, and face his punishment for these thefts, as well as for his repeated demands that we free Tibet and his continued poaching of deer in Yu Nan province." Law enforcement officials, acting in liason with the Nottingham Sheriff's Department, have also concocted a scheme to capture the elusive archer by staging an archery contest with an especially large and valuable gold medal as the prize, an event already underway. The contest is currently in the semifinal rounds and is being led by Britain's Rob Enhood, a mysterious eyepatched figure with a penchant for archery so accurate that he routinely splits the arrows of his competitors.